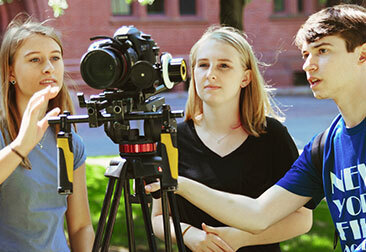 The 4-Week Filmmaking Camp is one of our most popular workshops. 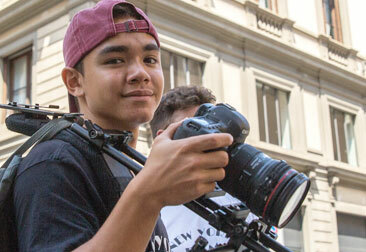 The teen filmmaking camp is offered at our campuses in Los Angeles, New York City, and around the world. It provides students with a strong introduction to the foundations of film craft. The one-month length of the program fits easily into most students’ summer schedules. This is a full-time program that requires students to make a genuine commitment to the schedule and workload. The 4-Week Filmmaking Camp for teens is structured around the production of three short films of increasing complexity. Students spend their days either in class learning the essentials of filmmaking from industry professionals or applying those lessons to their own original film projects. Weekends are reserved for writing, relaxation, and organized trips and activities. Each student writes, directs, shoots, and edits three short films of his or her own, using HD digital cameras, professional lighting packages, and industry-standard digital editing software. Hands-on classes in directing, writing, editing, cinematography, and production cover all the creative and technical demands of telling a story with moving images. Each week, all student films are screened and critiqued in class with the instructor. During each week of the camp, students are devoted to writing, producing, directing, and editing a different film project. Students work in four-person crews to complete each film. Every student directs three films. When their colleagues direct, students rotate in each crew among the key crew positions (director of photography, assistant camera, and editor). At the end of the camp, the final films are celebrated in a screening open to cast, crew, friends, and family. All students who successfully complete the camp will receive a New York Film Academy certificate. Students in the four-week filmmaking summer camp for teens will take a variety of classes that are designed to prepare them for the film set. The following classes are offered during the camp’s four weeks. • Director’s Craft: Students are taught the language of filmmaking and the director’s craft as applied to the digital format. • Writing: This class teaches basic screenwriting structure, and works to build a structural understanding of story. Students work to formulate their film ideas in this class. • Hands-On Digital Camera and Lighting: Classes will help students master the digital medium including white balance, shutter speed, focus, video latitude, gels, and filters. • Production Workshop: This class is designed to demystify the craft of filmmaking through in-class exercises shot on film under the supervision of the instructor. • Digital Editing: Students learn to “log and capture” their digital footage into industry-standard editing software. • Working with Actors: Students get instruction and practice in language, technique, and etiquette useful in pulling effective performances from actors in their projects. Over the four weeks of the camp, students spend each week working on a film project of increasing difficulty and getting the chance to apply the different lessons they learn in class to an actual film production. Students are expected to complete the following projects. • Mise-en-scène: In their first film, students are introduced to mise-en-scène, or directing a shot to visually tell a story. Once they create a dramatic moment, they concentrate on the dynamics of the shot that will best express it. This project teaches students how the relationship of the subject and the camera creates drama. • Continuity Style Directing: Students explore film grammar while using the digital camera. Students are taught to plan and shoot “coverage” of a dramatic or documentary subject. Students learn how different camera angles, camera movements, focal lengths, lighting and blocking actors combine to bring the scene together seamlessly in the editing room. • Final Film: This third project introduces students to the relationship between sound and film, as well as to narrative tools like montage and jump cuts. In this project, students are encouraged to explore a more personal form of visual storytelling. The 4-Week Filmmaking Camp attracts a diverse, international group of students who share a passion for telling stories through moving images. Each class is limited in size. The compressed length of the course and the subsequent, focused level of collaboration required inevitably brings classes and crews close together. Students must rely on each other’s skills to complete these films in four weeks. The experience is sometimes exhausting, but always rewarding. The combination of non-stop collaborative work, the mix of diverse cultures and experiences, a shared passion for film, and the opportunities afforded by the various summer locales make this summer camps an intensely enriching experience.